There are many conditions in place that could lead to his extradition back here. By 2022, Worldpay predicts a 48% growth in Singapore’s eCommerce market. Such growth amounts to US$7.4bn or 7% CAGR. Channel NewsAsia is now live 24/7 on YouTube. The announcement comes as YouTube and Singapore’s largest content creator and transmedia company Mediacorp on Friday (Feb 1) unveiled a strategic partnership to deliver an enhanced product experience for audiences and advertisers in Singapore. Following the death of operationally ready reservist Corporal First Class (NS) Aloysius Pang, the Singapore Armed Forces (SAF) announced that they had lowered the training tempo – referring to the duration, frequency and intensity of training activities – in order to allow units more time to comprehensively review their training programmes with the aim of reducing training risk for all servicemen. Singapore is getting tough on pilots who drink and fly with plans for random alcohol testing from March. The Straits Times understands this will affect all departing pilots, including those from foreign airlines. Foreign vehicles with several fines related to traffic and parking violations including those with vehicular emissions offenses can no longer enter Singapore beginning April 1. SOME may applaud this move. Some may slam it outright. Some may say it’s worth a review as part of successful ageing which requires long-term planning, There is a serious push to urge the government to hike CPF contribution rate for workers above 55 to 37 per cent to ensure that older workers are paid the same as their younger colleagues. Singapore has a positive outlook for the e-commerce industry’s future. The country expects a 48% increase in e-commerce operations or about $9.98 (US$7.4) billion by 2022. The sounds of children laughing from a nearby primary school fills the air. At 7am, Madam Ong Bock Hoe peers over the rooftop railing to watch the pupils chase one another at a basketball court below. Foreign vehicles with outstanding fines for traffic, parking or vehicular emissions offences may be denied entry into Singapore from Apr 1, according to a press release on Friday (Feb 1). On February 2, 2019 (Saturday), a tribute event for the Merdeka Generation was held at Gardens by the Bay with Prime Minister Lee Hsien Loong being one of the guest speakers. EVEN though the Lunar New Year celebrations are around the corner, not everyone enjoys the same rush of reunion dinners and lou heis, not to mention the socialising you have to do with relatives you meet this one time out of the entire year. The field of environmental, social and governance (ESG) investing has undergone rapid changes in recent years. We look at five trends and what they mean for investors. For Madam Gena Tan, Sunday’s (Feb 3) visit by Prime Minister Lee Hsien Loong to Teck Ghee market to exchange Chinese New Year greetings and distribute red packets to residents and stall owners held special significance. The Republic of Singapore has liberated its Model Artificial Intelligence Governance Framework which was announced by Minister for Communications and Information, Mr. S Iswaran at World Economic Forum Annual Meeting held between 22-25 January 2019. Motorists can expect long queues at the Causeway over the Chinese New Year period, with some travellers reporting delays of more than three hours before clearing Malaysian Customs on Friday. Singapore is getting tough on pilots who drink and fly, with plans for random alcohol testing from next month. The Sunday Times understands this will affect all departing pilots, including those from foreign airlines. Like many Singaporeans, real estate industry executive Wendeline Goh has a love affair with property. But unlike most of us, she bought her first private apartment at the tender age of 26. As a small nation, we must never allow ourselves to be polarised and divided because we need our collective strengths and other resources to succeed in the “fourth wave” of industrial revolution. For the second time in three months, former presidential candidate Dr Tan Cheng Bock met Lee Hsien Yang for breakfast today, amid speculation of a burgeoning alliance. Tan and Lee are having a second well-publicised breakfast in three months. The Singapore Sports Hub has been in the news this week following the shock resignation of its chief executive officer Oon Jin Teik. The former national swimmer’s departure was announced on Monday (Jan 28) though he will stay at the helm till April. 1,014 general practitioner (GP) clinics will be open during the Lunar New Year public holidays from 4 to 6 February 2019, at various times, the Ministry of Health (MOH) announced in a press release on Friday (1 February). More than 2,500 active mobility-related offences were recorded between May and December last year, according to the Land Transport Authority (LTA) on Friday (Feb 1). On February 1, 2019 (Friday), Singapore Post (SingPost) released a statement saying that its third-quarter net profit increased almost 16% compared to last year which was mainly due to the selling of its stake in a Chinese company. Eat lots of bak kwa and pineapple tarts. Watch reruns of Stephen Chow’s God Of Gamblers II on TV. Lose half of your hongbao money in blackjack. 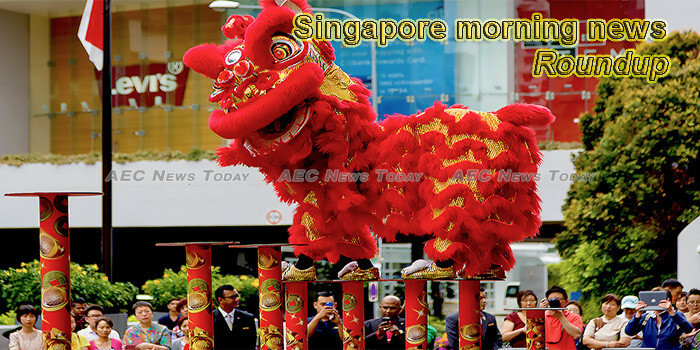 This week’s Singapore morning news feature photo acknowledges Chinese New Year, 2019.